Industrial chain manufacturing requires efficiency, process speed and repeatability. These are crucial to succeed in today's economy. Manufacturers investigating equipment upgrades understand that to compete the global marketplace, they must find machinery that optimizes product quality and increases throughput. 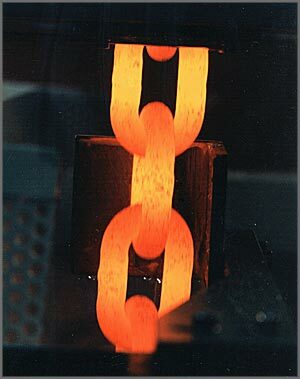 Traditional furnace hardening does not consistently produce the quality necessary for high grade chains because of the uneven heating and cooling inherent in such an inexact process. Innovative induction heating machines from GH IA offer several advantages: precise temperature control, guaranteed line spead, increased throughput, and the overall heating quality required for the chain manufacturing process. A versatile induction heating machine can be employed for pre-heating, austenitizing and tempering. When part quality is critical, rely on a custom-designed induction heating solution from GH IA to meet and exceed your specific process requirements. Watch our YouTube chain heating video.